I bought my stainless ‘ebay exhaust’ – the one everybody uses – months ago but never had the chance to get it fitted. These kits almost fit the TT250, but there’s one definite modification required; you have to widen or cut the flange as it’s not drilled wide enough for the 229cc engine’s exhaust port studs. My neighbour (actually the maintenance guy for place I live in) offered to help me cut the flanges with his grinder and vice. On friday night we did this with the accompanying (somewhat terrifying to the uninitiated) shower of sparks. I was a bit worried about the studs and cap nuts, already haven taken the bike through winter. 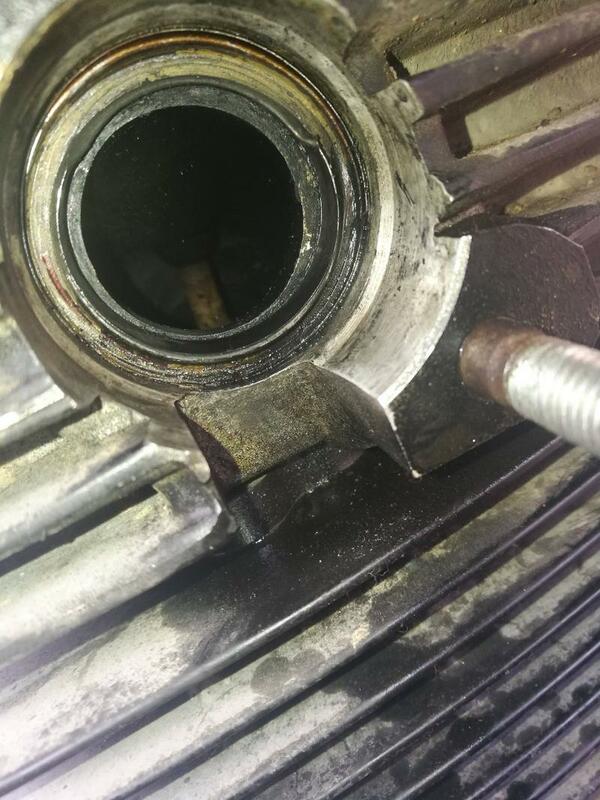 In fact they came off with just a light turn of a ring spanner; however the bottom stud unscrewed from the cylinder block rather than the cap nut. The threads were in good condition; but I couldn’t get the cap nut off so resolved to get a spare. Autozone and Advance Auto Parts didn’t have anything suitable – they sold M8 x 1.25 studs but they were too long. A local hardware store had a good selection so I armed myself with a couple of spares. I also bought a nut splitter and some small locking vise grips, placed the grips on the smooth part of the stud and was able to turn it off. My cleaning and scrubbing the nut while it was on the bike had let a lot of WD40 penetrate in and gum up the threads, but it was basically fine, so I put it back on the bike, screwing it in with my fingers. No problems. I bought new nuts and lock washers. The photo revealed these were deformed at the top, and I realised I was looking at the existing gasket which had a squared cross section, and had been pretty well squashed. I grabbed it with some needle-nose pliers and it popped out. I put the new one in (I dabbed a little grease on it to make it stick as it kept dropping out and tried the new header for size, screwing the nuts on finger tight to get an idea of fit. Some people have got lucky with the fit of these things. I knew straight away the clutch arm was going to be close, and I figured it would be a little clearer when it was all tightened up, but for now it made a little ‘tink’ every time I let the clutch lever out. I could not move it up as this would bring the pipe into contact with the frame; I could try and bend or dimple it, but it really didn’t have much motion available at all. So I knew I had to make some sort of bracket. 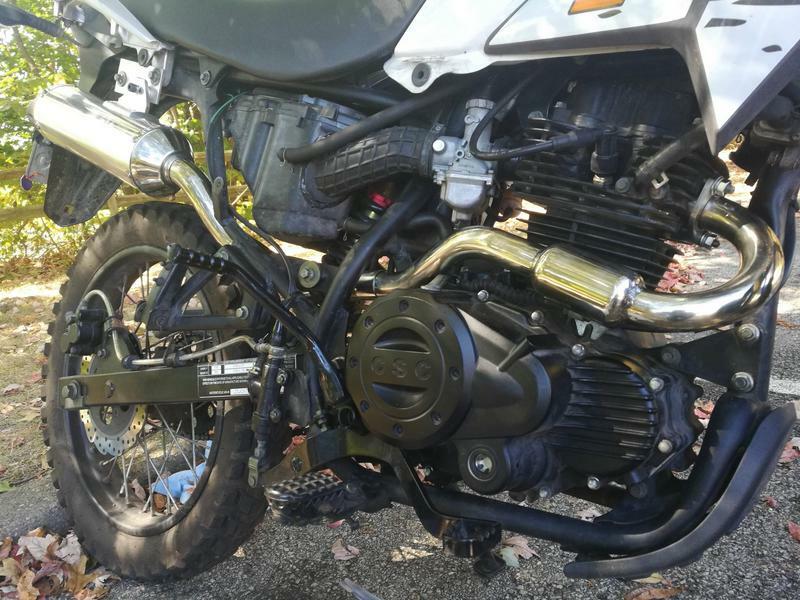 I was still unhappy about the clutch clearance, so I Googled some advice about how to, er, ‘shape’ exhaust pipes and the most simple way appeard to be to whack it with a ball-peen hammer. So I got a regular ball peen hammer (6 bucks, Harbor Freight) and marked the spot with a sharpie where the clutch actuator was touching, and set about whacking my exhaust. A few blows made the material dimple enough to give about 2mm clearance (it actually increases when bike is hot) and it’s on the underside so not visible. Last job was to take the carb off and fit the 115 main jet (already had a 27.5 pilot which I knew is a little rich so should be fine with a more open pipe) and put it all back together. It sounds great, and the bike pulls strongly throughout the rev range. I was pretty pleased with the result.